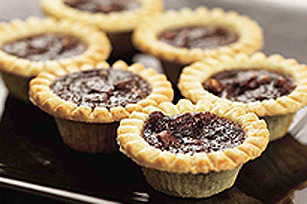 Bananas and chocolate chunks add extra flavour and richness to these mini tarts laden with crunchy pecans. These Chocolate Pecan Banana Tarts are not to be missed! Bake tart shells as directed on package. Beat egg with brown sugar. Stir in mashed bananas, chocolate and pecans. Spoon filling into baked shells. Bake at 375°F for 10 to 15 min. Cool slightly before removing from cups.